Our miniature mint baking morsels are perfect for cookies, brownies, cakes and candies. 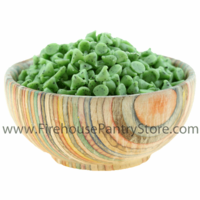 They are pastel green in color and are sprinkled throughout with dark brown chocolaty bits. We love them sprinkled onto ice cream. Mini-sized chips (4M - 4,000 drops per pound). Ingredients: sugar, partially hydrogenated palm kernel oil, reduced mineral whey powder, nonfat dry milk solids, gum arabic, anhydrous dextrose, soy lecithin (an emulsifier), artificial color (yellow lake 5, blue lake 1, red 40, blue 1, yellow 6, yellow 5), salt, natural and artificial flavor. Contains Milk & Soy. Packaged in a facility that packages wheat, milk, soy, egg, peanuts, and tree nuts. This product may sustain melting when shipped during warm/hot weather. It is only available during summer months with ice packs. 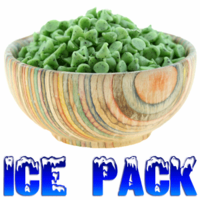 Add additional ice packs to your order here.